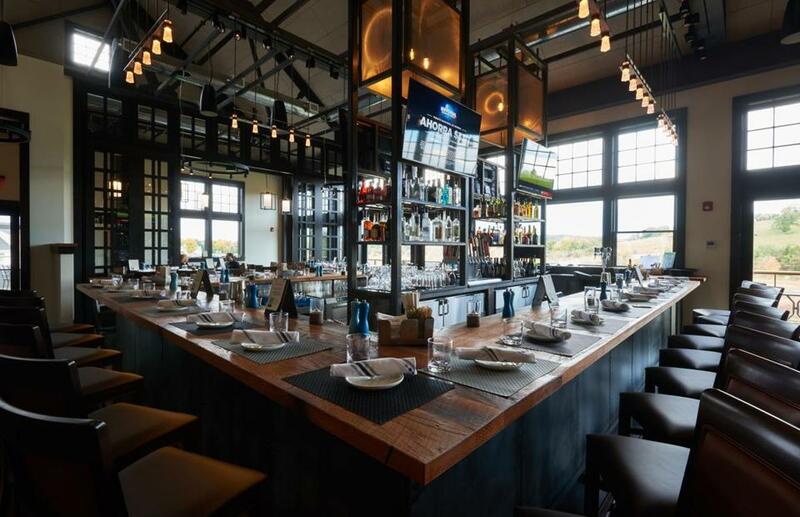 Forge & Vine restaurant — located on the site of the old inn’s blacksmith shop — has become a dining hotspot in the Groton area. GROTON — Curiously, it was fire that destroyed the old Groton Inn, and it is fire that is bringing it back. In 2011, the Groton Inn burned to the ground, ending the storied history of the c.1678 hostelry that once hosted Paul Revere and the Masons and was considered to be the oldest continuously operating inn in the United States. Last spring, the Groton Inn re-opened, and in October, its restaurant, Forge & Vine, debuted. The focal point of the sprawling eatery: a custom-made, eight-foot-long wood-fired grill, its flames spiraling upward to singe the skin of whole chickens on a rotisserie. Diners angle for seats at the chef’s table to watch the flame-stoked action. So they’re celebrating fire now. Too soon? Apparently not: On a recent Saturday at the unfashionable hour of 4:45 p.m., the restaurant was full. By 6:45, folks were waiting an hour for a table. In a few short weeks, Forge & Vine — located on the site of the old inn’s blacksmith shop — has become a dining hotspot in the area. There’s a raw bar in the front of the restaurant, and a pizza oven that yields delectable flatbreads, in addition to well-executed entrees like potato-crusted cod with smoked bacon-leek fondue and wood-roasted salmon with maple-lemon glaze. Rosy slabs of meat sizzle on the grill. Couples on date nights share a wood-fired dry-aged ribeye for two, or a double-sized paella studded with local seafood. Clearly, Groton — about 40 miles west of Boston — was ready for this. 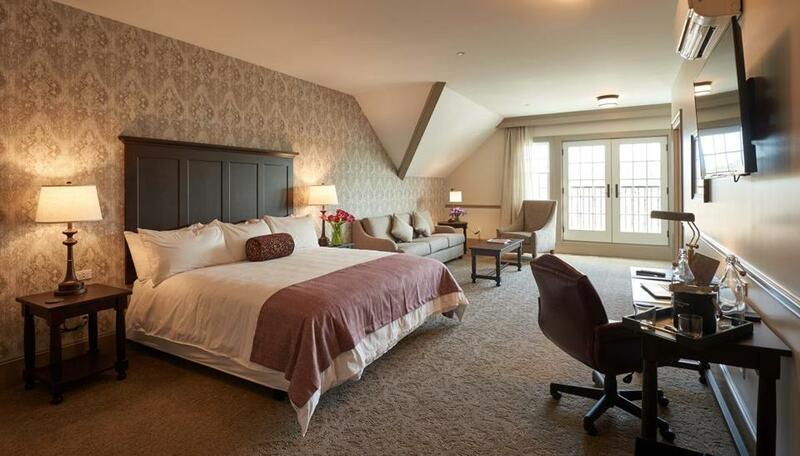 The new Groton Inn preserves the historic feel of the original but incorporates modern amenities. But back to the inn: Who actually stays in Groton, population 11,364? According to Groton Inn general manager Warren Francis, they get corporate business from the I-495 belt, along with parents and visiting scholarly types from prep schools Lawrence Academy (next door) and nearby Groton School. For those considering a country getaway, Groton offers farm stands galore, plus Gibbet Hill, laced with foot trails, Rocky Hill Wildlife Sanctuary, and Nashoba Valley Ski Area, just a few miles away. 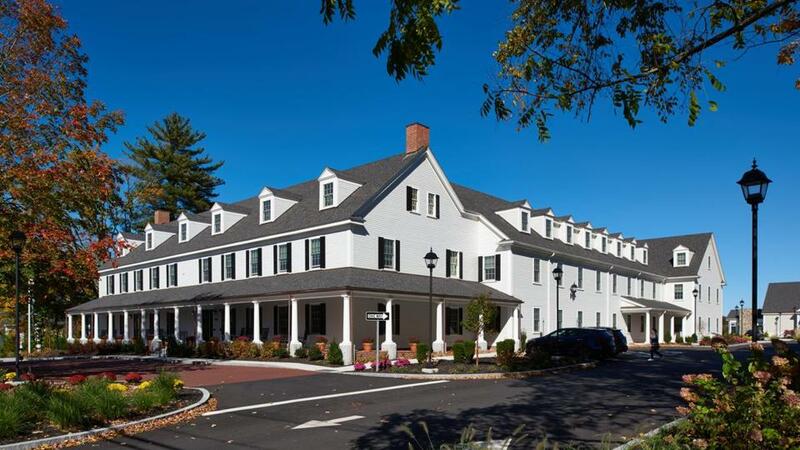 In the meantime, those who discover the new Groton Inn will find a 60-room property that preserves an historic feel but incorporates the modern amenities that guests expect now. “Since the inn is part of Groton’s Historic District, the town weighed in on how things should look,” Francis says. The inn is managed by the Migis Hotel Group, best known for Migis Lodge in Casco, Maine. Built on the footprint of the old inn, the new incarnation has old chair rails and picture rails, a wood-burning fireplace in the lobby, and an 1800’s mural that was moved from a private home in the area. Black-and-white photos used as art throughout the inn were borrowed from the Groton Historical Society; there’s also a collection of regional artwork that is rotated seasonally. They’ve amassed a collection of memorabilia from the old inn that people have donated, including an original Indian shutter and a Revolutionary War soldier’s lamp. These will eventually be displayed in a museum room at the inn. They’ve also added an outdoor courtyard, facing the hillside, with a gas fireplace, where they’ll host live music in warmer months. A guest room at the inn. Guest rooms are pretty but not flashy (so New England), done up in tones of putty and white. Beds with ebony wood headboards face 50-inch flat-screen TVs. Rooms have coffee makers, luxury linens, bathrobes, and toiletries from Gilchrist & Soames. Some rooms have bathtubs. Suites have separate sitting rooms and Juliet balconies. There’s also a small workout room. Breakfast is served in Keep’s Conservatory. But dinner at Forge & Vine is the main event: the restaurant seems to have the right ingredients to keep people coming back. Should they make it a late night, a comfy bed can be arranged. Not to mention, there are the undiscovered charms of Groton. “We might be sleepy old Groton, but not for long!” Francis says. The Groton Inn, 128 Main St., Groton. Rooms from $169.